Taking a ride with Mazda’s largest crossover utility vehicle. Mazda offers its CX-9 in four trim levels. Mazda threw a monkey wrench into the midsize three-row utility vehicle segment when it updated the current-generation CX-9 in 2016. This model is a cut above most competitors and is best compared with the likes of the Buick Enclave, itself a near-luxury crossover. Where the first-generation CX-9 supplied a laudable model for the segment, the latest version is simply better than the one it replaced. 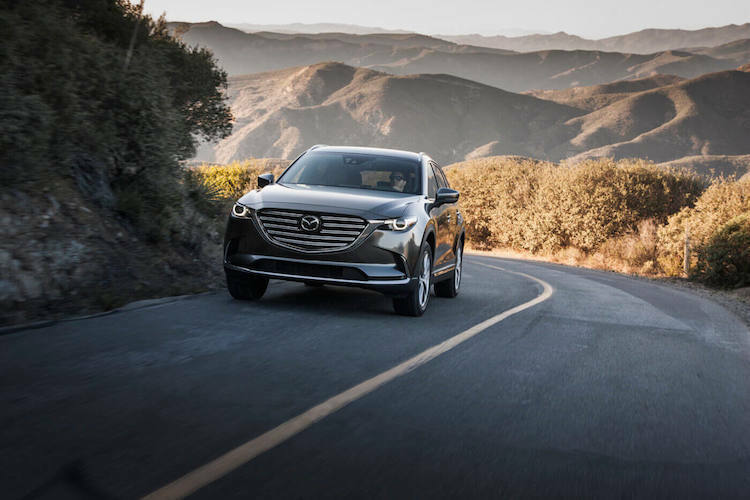 What makes the 2019 Mazda CX-9 so special is its styling and use of high-quality materials, especially as you move up the model range. Mazda offers the CX-9 in four trims: Sport ($32,280), Touring ($35,330), Grand Touring ($40,840), and Signature ($45,365). Front-wheel drive is standard; all-wheel drive is available (standard on the Signature). All models come with a turbocharged four-cylinder engine paired with a 6-speed automatic transmission. For 2019, Mazda makes Android Auto and Apple CarPlay smartphone compatibility available. Also, the CX-9 features a new surround-view parking camera system. Finally, the suspension system has been retuned, supplying this SUV with a smoother ride. 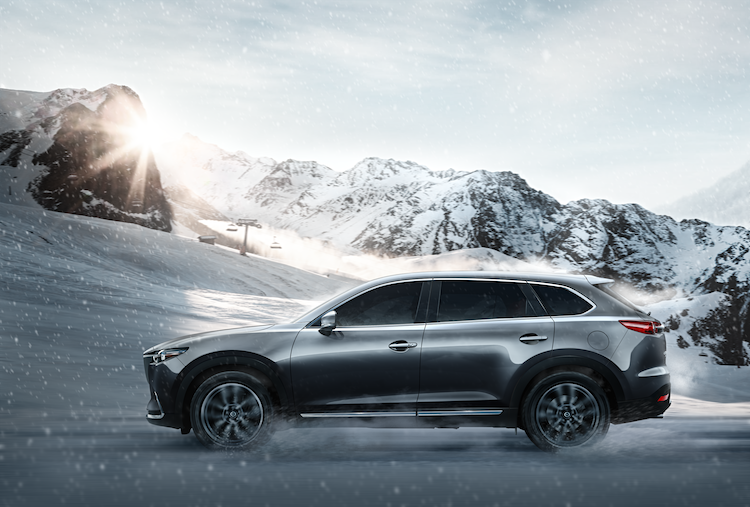 The Mazda CX-9 with the available all-wheel drive is ideal where wintery conditions prevail. Mazda’s KODO or “soul in motion” design is used across the brand’s model line. KODO signifies powerful, yet elegant flowing lines, carefully placed creases, smart cutouts and an overall look that punches above the normal. The look is especially handsome on Mazda’s cars, including the MX-5 Miata and the Mazda6 sedan. But it also transfers well to crossovers, including one the size of the CX-9’s proportions. My favorite features are the bold, upright grille along with the rising beltline and falling roofline. The latter two combine to impart a sporty look not common to SUVs. Also, the headlights connect to the top of the grille and flow dramatically outward. At the rear, a swoopy chrome bar connects the sleek wraparound tail lamps. In all, the Mazda’s visage isn’t easily mistaken for another model. Standard features include LED lights, power side mirrors, 18-inch aluminum alloy wheels, and dual exhaust tips. As you move up the trim levels, Mazda rolls out automatic headlights, LED fog lights, heated side mirrors, a power moonroof, aluminum roof rails, 20-inch wheels, and brightwork trim. 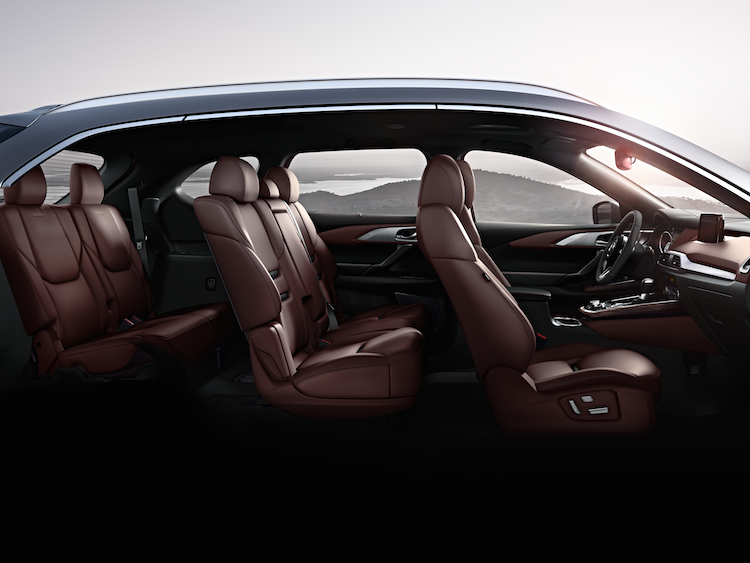 The CX-9’s interior is especially elegant with the Signature trim. There are mainstream and there are luxury models. When it comes to interiors, the two are generally worlds apart. But the Mazda CX-9 is a bridge builder between the two camps, benefitting from a design that’s stylish, clean and elegant. What’s especially intriguing is how all this is achieved with the top-trim level models. Here, you’ll find the finest leathers, genuine wood and sculpted aluminum. The model name may be mainstream, but the materials match what you’d find in an Audi, Lexus or Cadillac model. Standard seating is for seven, with a split seatback in the middle row. The first row seats are comfortable and supportive as are the middle seats. The third row, like that in many such crossovers, is best left for youngsters as legroom is limited. 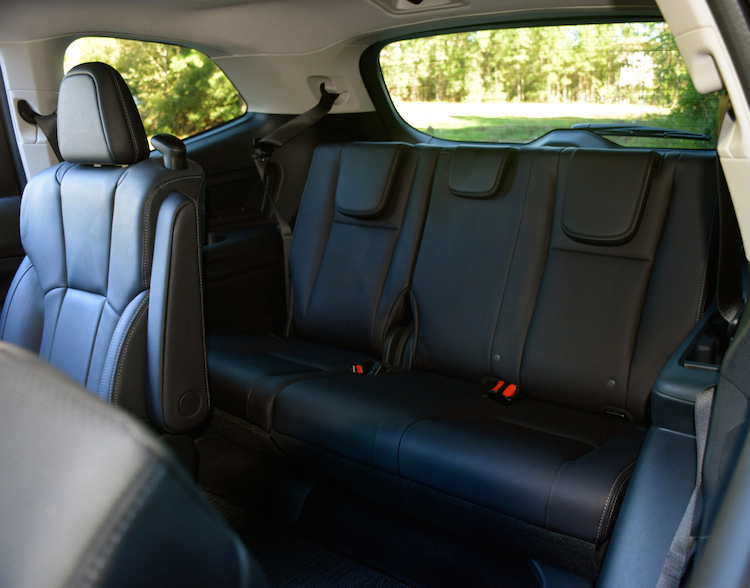 Other passengers will simply fold the rear seat to gain additional storage space. I especially liked the CX-9’s dashboard which sits low, flows elegantly and has an uncluttered center stack. The display panel sits on top of the stack and is similar to Audi’s with its black background and white lettering. Standard features include full power accessories, a tilt-and-telescopic steering column, cloth seats, and three-zone automatic climate control. Upgraded features include keyless entry with push-button start, power front seats, heated and cooled front seats, a heated steering wheel, and leather-trimmed seats. Tech. We love it and want more of it. Fortunately, the CX-9 does not disappoint. The standard Mazda Connect infotainment package includes a 7-inch screen, six speakers, two USB ports, an auxiliary input jack, and HD Radio. You’ll also find for the first time Apple CarPlay and Android Auto smartphone integration starting at the Touring level. Other upgrades include a navigation system, an 8-inch screen, satellite radio, and a 12-speaker audio system. Three rows of seating market this Mazda model. The dial-based infotainment interface is another feature Mazda “borrows” from high-end German models. The learning curve may challenge some people, but it is intuitive and easy to use. 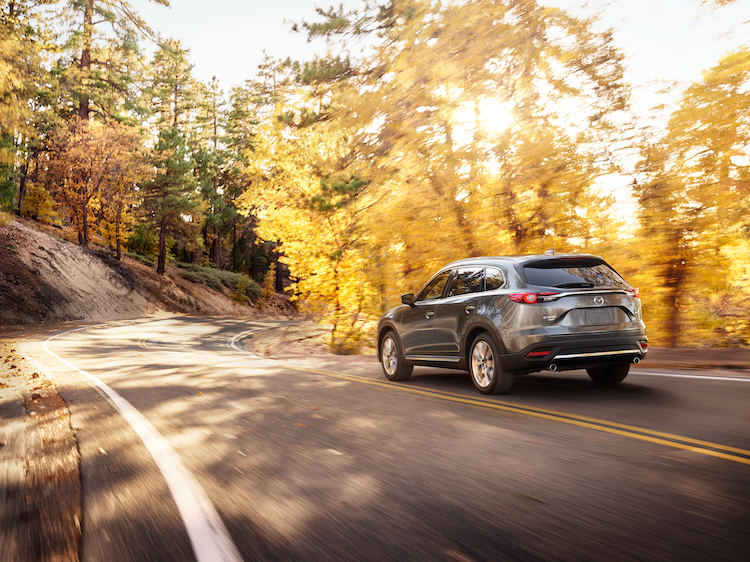 Among safety features, the 2019 CX-9 has blind spot monitoring, rear cross traffic alert, and low-speed automatic braking. Available features include high beam control, lane departure warning, lane keep assist and radar cruise control. At the top of the list, you’ll find a traffic sign recognition system, front and rear parking sensors, and a 360-degree view monitor. Some manufacturers offer multiple powertrain choices with their crossovers, but in the 2019 Mazda CX-9, you are limited to just one. And that would be a turbocharged 2.5-liter four-cylinder engine. The Mazda’s engine has an output of 227 horsepower (250 when sipping premium fuel) and 310 pound-feet of torque. While the first number is important, the second one is especially significant when passing or pulling. It essentially flips the Buick Enclave’s numbers (310 horsepower and 266 pound-feet of torque) achieved by a naturally aspirated 3.6-liter V6 engine. Perhaps the Mazda engine’s shortcoming is in towing. Where many competing engines tow up to 5,000 pounds when properly equipped, the Mazda turbo stops at 3,500 pounds. Under normal throttle, the CX-9 moves steadily with the turbo spooling up at the right time to deliver an extra burst of power. Under hard acceleration, the turbo lag is reasonably short, decisive and satisfying. I’m nearly always a proponent of shoppers choosing all-wheel drive when shopping for a three-row crossover. For one, you gain an extra measure of control as power is distributed to the rear wheels as needed. This is important when driving with a full load of people on a twisty road with all your gear onboard. It is also most useful whenever roads are slippery, especially under winter conditions. What especially appealed to me is that the CX-9 drives like a smaller vehicle. Its steering is crisp and it maneuvers with ease. You’re not navigating a boat-like vehicle here, rather an SUV tuned to behave like a car and ride like one too. The 2019 Mazda CX-9 should meet the needs of a growing family and do so within their budget. The Grand Touring model delivers many of the amenities customers want in this segment. With available all-wheel drive, this model’s MSRP nears $43,000, with your out-the-door price coming in perhaps around $40,000. If you do choose the top-trim Signature model, your price included all-wheel drive. My test model included the available Rear Seat Entertainment System ($1,995, dual 8-inch LCD monitors, two headphones, SD card slot, and HDMI ports). It also had the Front and Rear Bumper Trim Package ($575) and illuminated doorsill trim plates ($500). All these features brought this model’s final price to a fully-optioned $49,780. Besides the Buick Enclave, consumers might cross-shop the Nissan Pathfinder, Ford Explorer, Volkswagen Atlas, GMC Acadia, Toyota Highlander, Dodge Durango, and the Honda Pilot. Beyond the base model, a power liftgate is included. 2019 Mazda CX-9 photos copyright Mazda USA. Subaru’s Ascent is this brand’s largest SUV. The 2019 Ascent is the largest of four Subaru utility vehicles. The 2019 Subaru Ascent fills a hole in this automaker’s product line, by supplying a sizable three-row crossover SUV. It represents Subaru’s largest model yet, a vehicle designed to keep growing families in the brand fold. 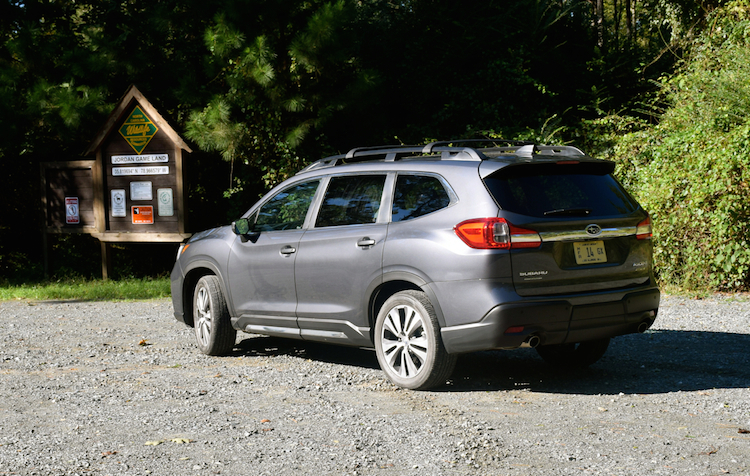 Although the Ascent is not Subaru’s first three-row model — that honor belongs to the Tribeca, last built in 2014 — it is the first one to take advantage of the brand’s new modular architecture. Thus, the Ascent has an additional five inches between the wheels, is two inches wider and comes in about four inches taller than the Tribeca. These specifications mean the 2019 Ascent is better able to accommodate seven passengers in comfort than the Tribeca. 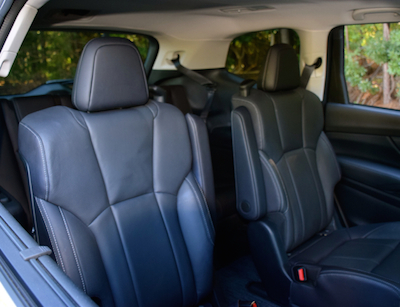 Further, with three rows of bench seats, the Ascent offers room for eight as do the Chevrolet Traverse, Honda Pilot, Buick Enclave and the Toyota Highlander. 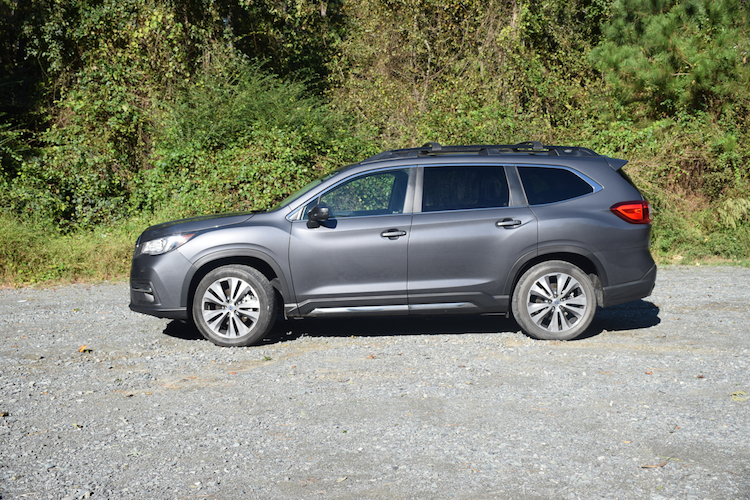 But one of the most significant differences between the 2019 Ascent and its competitors is that the Subaru is the only one with standard all-wheel drive. Each of its competitors has standard front-wheel drive with available all-wheel drive. Subaru offers the 2019 Ascent in four trims: Base ($32,970), Premium ($35,170), Limited ($39,970) and Touring ($45,670). All prices include the $975 destination charge. The Base and Touring models do not offer package upgrades. The Premium model offers four package choices, including a pair of Convenience ($1,460) and Sporty Packages ($4,260) based on the number of seats chosen (seven or eight). The Convenience Package includes a power rear liftgate, keyless entry, an automatic dimming rearview mirror, and reverse automatic braking. The Sporty Package builds on the Convenience Package, adding 20-inch wheels, a panoramic moonroof, an 8-inch navigation system, and a cargo area cover. As for the Limited model, it offers a pair of Technology Packages ($2,950), once again based on 7- or 8-passenger seating. This package includes a panoramic moonroof, navigation, a cargo area cover, and a 14-speaker Harman Kardon audio system. 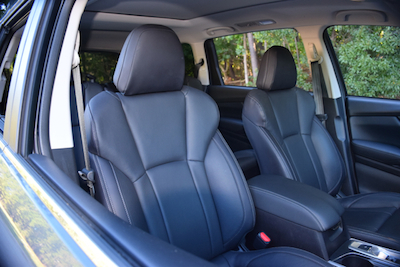 The Ascent’s center console is clean and uncluttered. We’ve already made the point that the 2019 Ascent is the largest Subaru model ever. Beyond that, the Ascent shares some of the styling elements of other Subaru models, although its diamond-shaped grille is larger and the headlamps and lower intake are also unique to this model. The Ascent’s broad hood, firm shoulders and distinct wheel well arches impart strength. A high beltline dominates the profile. Our test model included roof rack side rails and crossbars. From the rear, you’ll find large wraparound tail lamps, a liftgate spoiler, chrome trim, and dual exhaust ports. Standard exterior features include halogen headlights, folding side mirrors, 18-inch aluminum-alloy wheels, and roof rails. Available equipment includes LED steering responsive headlights, LED fog lights, heated side mirrors, a power moonroof, and a power liftgate. Inside, the cabin is clean, well ordered and roomy. If you don’t need eight seats, I strongly encourage the seven-seat layout. The middle-row captains’ chairs are very comfortable. They slide and tilt forward for ease of access to the third row. They also allow for more legroom (especially for the middle seated passenger). The Ascent was absolutely designed with families in mind. You’ll find 19 drink holders, although they can be filled with other items. Look around and you’ll find places to stash your phones and door cutouts for resting elbows. The front seats are comfortable, although if they were a bit wider they’d please the largest drivers amongst us. Standard interior features include full power accessories, cloth seats, and three-zone climate control. The list of available equipment includes a heated steering wheel, power front seats, leather-trimmed seats, heated and ventilated front seats, heated outboard second-row seats, and woodgrain trim. Subaru is synonymous with safety and it is also a technology leader. The automaker marries the two with its EyeSight Driver Assist Technology. EyeSight acts as an extra set of eyes and includes lane departure and sway warning with lane keep assist, adaptive cruise control, pre-collision throttle management, pre-collision braking, blind spot detection, rear cross-traffic alert and reverse automatic braking. 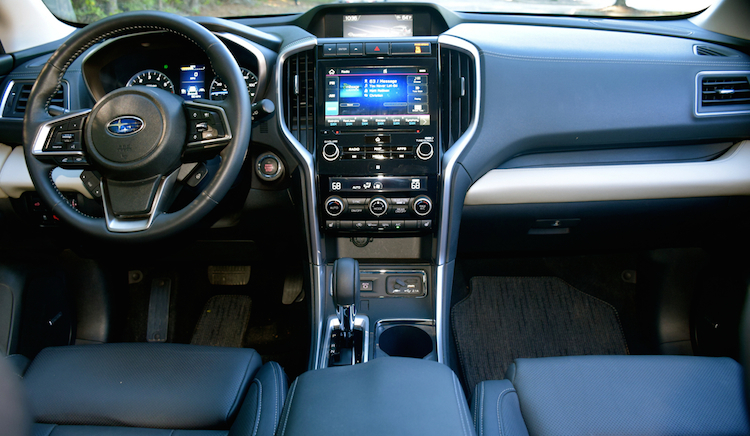 Standard across the Ascent model line, the technology is as advanced as anything offered elsewhere — typically, however, most manufacturers don’t offer these features except on top-trim models. EyeSight, Subaru’s driver-assist technology, includes automatic braking and adaptive cruise control. A 2019 Ascent with its available automatic adjusting headlamps (as featured on my test Limited model) earns a Top Safety Pick+ rating from the Insurance Institute for Highway Safety (IIHS). Subaru typically garners the highest scores, underscoring its stellar reputation for all things safety. The standard audio package includes a 6.5-inch screen. You’ll also find a six-speaker audio system with a CD player, HD Radio, and satellite radio. Other features include Android Auto and Apple CarPlay smartphone compatibility, USB ports, auxiliary audio input, navigation, Bluetooth, and a host of cloud-based applications. Options include an 8-inch color display, additional USB ports, and the Harman Kardon audio system. 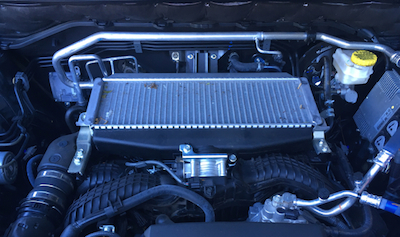 When I took delivery of the 2019 Ascent and drove it for the first time, I forgot that this model doesn’t have the six-cylinder engine used in some Subaru models. Instead, the Ascent is powered by an all-new turbocharged 2.4-liter four-cylinder engine. This is a BOXER engine, which means the cylinders are horizontally opposed, a layout prized by Subaru and Porsche alike. Subaru’s all-new Boxer engine powers the Ascent. What’s noteworthy here is that the engine bangs out 260 horsepower and 277 pound-feet of torque and is paired with a continuously variable transmission. Step-off acceleration imbues confidence and when full power is needed, the turbo spools quickly. To my surprise, turbo lag was absent and that’s no small feat. Usually, when pressing the gas pedal with impunity, the engine will hesitate slightly as the turbo activates. Happily, this was not the case with this Subaru, which only heightened this model’s driving experience. Another plus was the CVT. It behaved more like an automatic transmission as the built-in “steps” kept it from “stretching” under hard acceleration. You can also move the transmission shifter into sport mode and activate the paddle shifters. Here, the transmission mimics eight forward shift points. 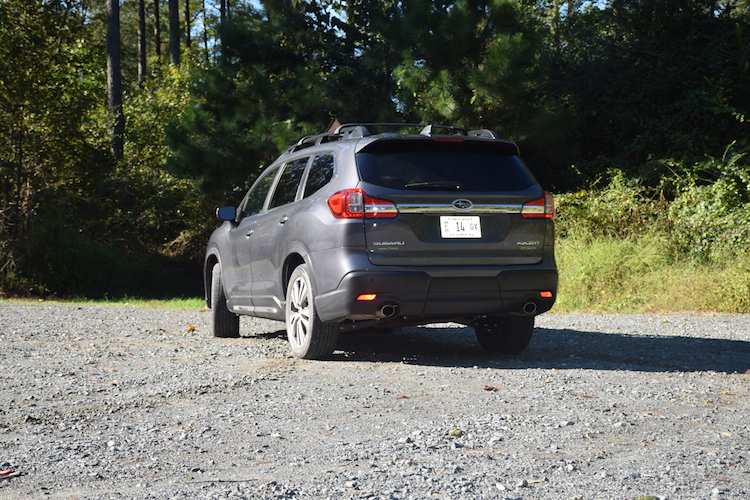 As for off-roading, the Ascent can handle light-duty work with ease. The standard X-mode variable transfer clutch lock control adjusts the all-wheel-drive mapping as well as throttle control and activates hill descent control. These features are useful for gravelly roads, but you won’t want to tackle the rocky terrain. As for fuel economy, the first two trims make an EPA-estimated 21 mpg in the city and 27 mpg on the highway. The two top trims lose 1 mpg. Another important feature is this model’s 5,000-pound towing capacity, the most we’ve seen from Subaru. That puts Subaru in good company, matching the top capacity of models like the Ford Explorer and ahead of the GMC Acadia (4,000 pounds) and the Mazda CX-9 (3,500 pounds). 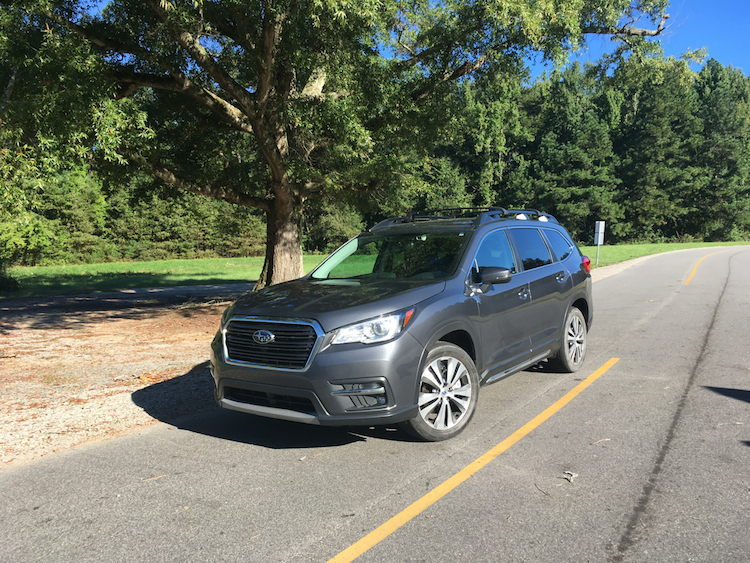 The Subaru Ascent does what it needs to do as it goes up against the top models in its class. Now, Subaru shoppers don’t have to leave the brand as their seating and storage needs increase. Indeed, not only does this model seat up to eight, but storage capacity maxes out at 86.5 cubic feet with the second- and third-row seats folded. That Subaru supplies its EyeSight technology across the model line means customers don’t have to upgrade and pay more to get what they want. The same can be said for all-wheel drive. That said, we think the Premium model with the available Sporty Package offers a sensible choice for many shoppers. With a price point just above $40,000, it also matches well with the competition. Roof rack cross rails and 20-inch tires are available. With X-mode activated, the Subaru Ascent is better prepared to handle gravel roads.